Cakes are a wonderful way to celebrate any occasion. There are hundreds of different types of cakes made all around the world as per their culture and traditions. Just like various flavours and toppings, there are many shapes of cakes which are popular. Pumpkin shaped cakes are also admired throughout the world during fall. Preheat your oven to 350 degrees in order to make a plain cake. Mix the ingredients nicely after separating the egg whites and yolks. Pour the mixture in a cake pan and place it in the oven for 25 to 30 minutes. Using a pumpkin shaped pan is considered to be the easiest way to shape your cake. If you have enough space in your kitchen, you can store that pan during the off season. Some people bake several pumpkin shaped cakes every season just to make sure that they make the most of the pan but this is not a very practical approach and you may get fed up of this cake shape soon. 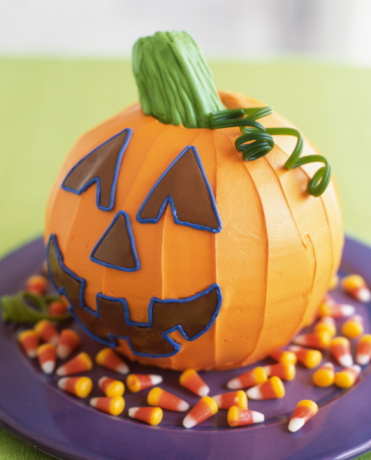 Another way of making a pumpkin shaped cake is to make a square cake first and then sculpt it. Grab a couple of round oven-safe mixing bowls of the same size and use them to bake your cake instead of the regular cake pans. These bowls can be made of either metal or Pyrex. Your cake should pop right out if you have greased and floured the bowls. Test the cakes with a toothpick when they are done as many recipes do not offer mixing bowl baking directions. For a round cake, you may turn one on top of the other, which should not require any special equipment or intricate cake-sculpting. You can use any cake in this method and it is considered to be the best way to make pumpkin shaped cakes.